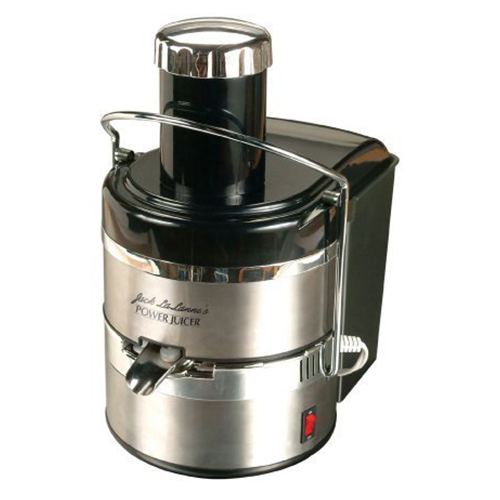 From one of the premiere brands of juice makers, the Jack Lalanne JLSS Power Juicer Deluxe features an oversized feeder chute and quiet yet powerful motor. It truly is one of the best Jack Lalanne juicers on the market. Finished in an attractive stainless steel and black housing, the JLSS Power Juicer Deluxe will look good on any kitchen countertop. The spout is uniquely formulated to prevent frustrating drips, and all components are dishwasher-safe for super fast clean-up. The JLSS Power Juicer Deluxe is one of the best centrifugal juicers on the market. Using a powerful but well-insulated motor, the stainless-steel blade will scythe through vegetables and fruits at 3,600 RPM with barely a sound. With the stylish food pusher and extra large feeder chute, whipping up healthy juice has never been easier. The included pulp collector is plenty big enough to handle a family’s worth of juicing, and clean-up is a snap. Nothing could be simpler than lifting the beautiful food pusher and inserting whole vegetables and fruits into the juicer. Takes just seconds to make juice from nearly any herb, vegetable, or fruit. As all parts of the JLSS Power Juicer Deluxe are dishwasher-safe, it’s a cinch to clean. Spout is specially designed not to drop, allowing you to drink your juice without worrying about spills on the counter top. Juice comes out strong and clear, with excellent separation of the pulp. Easily handles both soft and hard veg/fruit with ease. One-speed motor is powerful enough to handle even the crunchiest vegetables and fruits. Insulated housing means you feel more of a vibration than hear the roar of the powerful motor. Extremely quiet operation. For a centrifugal juicer, the JLSS Power Juicer Deluxe does an outstanding job of separating pulp from juice. The Power Juicer Deluxe has all all the best features that made the Jack Lalanne classic juicer such a massive seller. The high performance induction motor and surgical stainless blades deliver fresh, nutrient rich juice to help boost your energy for today’s hectic lifestyle. Lifetime motor warranty offers peace of mind, even with daily juicing. Inside the box you get the main juicer unit, detachable food pusher, stainless steel blade, and motor unit. Eating your daily servings of fruits and vegetables can be a real challenge. But with the Jack LaLanne JLSS Power Juicer Deluxe, making high-quality juice takes only a few seconds. With its whisper-quiet but powerful 3,600 RPM motor, whipping up juice from even the hardest fruits and vegetables is simple and easy. And because all the parts of the JLSS Power Juicer Deluxe are dishwasher safe, clean-up just takes seconds. Housed in a stylish stainless steel and black design, the JLSS Power Juicer looks fantastic on the counter. Spout comes with a handy stopper to allow you to swap out drinking glasses without leaving a mess on your counter top. Definitely one of the best centrifugal juicers on the market today.